If you see a hare in Devon, Cornwall, Dorset or Somerset please complete this hare sightings form (RTF) and return to the email address above. A new, project orientated initiative for the welfare and conservation of hares. When did you last see a hare? In 1880 there were four million brown hares in Britain and their springtime boxing antics were a familiar sight to many a countryside walker, but the national hare population has since suffered at least an 80% decline. A national survey conducted in 1997/98 estimated a population of 730,000. 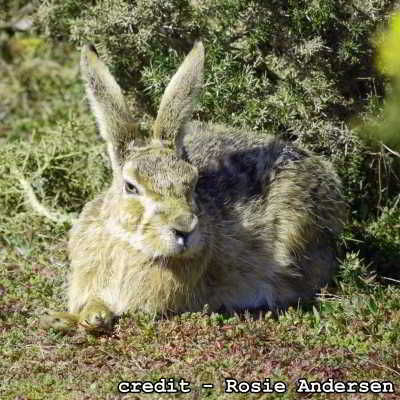 Putting that figure into perspective, the wild rabbit population is estimated at 40 million. 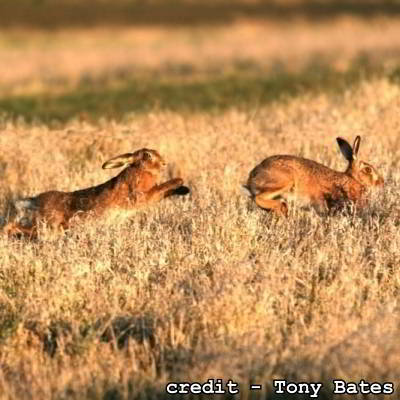 The hare's decline has been especially marked in the South-West where grassland farming predominates, as opposed to the mainly arable eastern counties, where hares remain relatively abundant in some areas. "I saw my first one yesterday near Wadebridge, Cornwall. I am 51 and walk every weekend and spent many years farming. Two others with me, similar age, none of us had experienced that before." The reasons for the decline are not entirely clear but intensification of farming and changed patterns of land use have been identified as important factors. "One of the greatest barriers to successful conservation of any species is a lack of knowledge on distribution and abundance". A hare survey in Devon and Cornwall. This is one of SWAFH's priority tasks. Volunteers will need to walk around a 1km square assigned to them three times during the autumn, recording any hares seen. If you think you may be able to help please contact SWAFH on the e-mail address above. We have no data of the situation in Britain, but in Germany an estimated 153,000 hares are killed by farm machinery annually. A research team in Denmark is developing a tractor mounted thermal imager of wildlife concealed in grass, but further work needs to be done on other crop types. System costs also need to be reduced to enable widespread deployment. Farms signed up to this Natural England scheme are known to favour hares. Uncultivated field margins are a management option which provides hares with the wild forage they prefer to cultivated plants and cover to rear their young. SWAFH therefore plans to conduct a programme encouraging more farmers to take up Environmental Stewardship and advising them on the best options for hares. SWAFH is run entirely by volunteers, so all funds received go towards running the group and financing project work. SWAFH has no membership subscription and relies entirely upon donations from members and the general public. If you wish to donate please use the donate button above, thank you. You do not need to be living in the South-West to be a member of SWAFH.